Prevention is the best way to keep a water body clean of zebra mussels. Zebra mussels (Dreissena polymorpha) are small, freshwater, bivalve shellfish that were likely brought to the U.S. as stowaways in the ballast water of ships. They are native to the Caspian and Black Seas south of Russia and Ukraine, and have since become widespread in both Europe and the U.S. They are easy to identify, with a distinct, flat-bottomed ‘D’ shape to their shells that allows them to sit flat against a solid surface, and black, zigzag stripes against a cream background that earned them their name. They grow around two inches long at most, and are microscopic in their larval stage, which is known as a “veliger.” They are short-lived (between two and five years), and begin reproducing at two years of age. Each female can release up to a million eggs per year. “Biofouling,” or the accumulation of adult zebra mussels on surfaces put in the water, is one of the more notable impacts zebra mussels can have on a local economy. 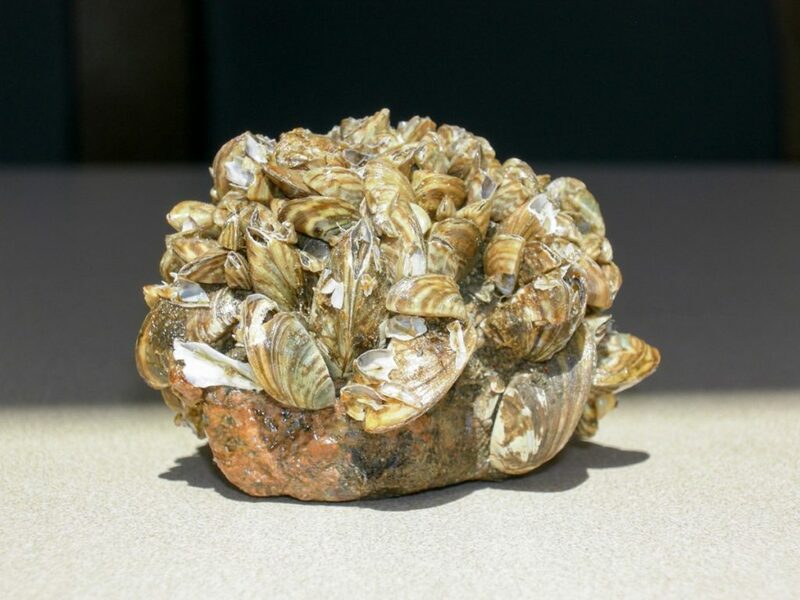 Zebra mussels are armed with rootlike threads of protein, called “byssal threads,” that allow them to firmly attach themselves to hard surfaces such as rocks, native mussels, docks or boats. Typically, this isn’t a problem for boats that are only in the water for short trips, but boats, docks or intake pipes that are left in the water for a long period of time can become encrusted and be very difficult to clean. If a boat owner also fails to drain the water from his or her motor, any veligers floating in the water will root themselves and clog the machinery as they reach adulthood.